Sleep disturbance is a prevalent and debilitating problem in palliative care that contributes to worse quality of life and adds to patient and caregiver suffering. Screening for this symptom in routine practice followed by a focused assessment and evaluation is essential given its consequences on daytime functioning and distress. 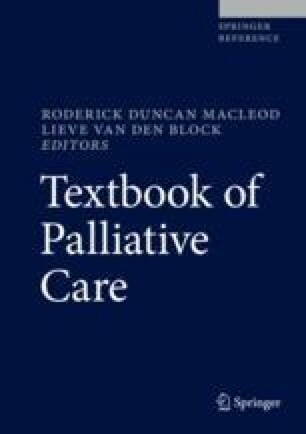 The causes of disrupted sleep in palliative care populations are multifactorial and include disease physiology, uncontrolled physical symptoms, adverse effects of medications, and emotional distress or psychiatric disorders. Attention to reversible causative factors where possible, detection of specific sleep disorders to ensure appropriate treatment, and development of a treatment plan individualized to the patient that takes into consideration prognosis are essential. Simple approaches such as sleep hygiene education may be helpful, but usually a combination of psychological and pharmacological agents is necessary for effective management. Cognitive behavioral therapy for insomnia (CBT-I) is considered first-line treatment for insomnia that targets the cognitive and behavioral factors that perpetuate this symptom but may require adaptation in the context of palliative care. Common medications used to manage insomnia include the benzodiazepine receptor agonists, benzodiazepines, and sedating antidepressants, but there is a lack of information about adverse effects of these drugs. High-quality research is needed to establish efficacy of psychological therapies and pharmacological agents for management of insomnia and other sleep disorders in palliative care. This chapter provides an overview of sleep disturbance, causative factors, and management of common sleep disorders of insomnia, sleep-wake cycle reversal, hypersomnia, and nightmares in palliative care.